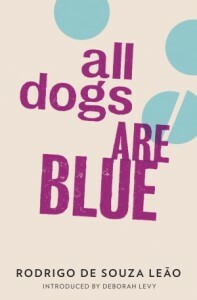 Reading Rodrigo de Souza Leão’s All Dogs Are Blue is like taking an acid-fueled journey into a mystified reality. The novel is about everything and nothing at all. The reader is faced with a guessing game. It can all be true or it can all be the rambling of a drug-addled madman. All Dogs Are Blue is Souza Leão’s last piece of work and a truly awe-inspiring, humorous, and grotesque semi-autobiographical novel. And, however hazy, the brilliance of the novel is crystal. Born in Rio de Janeiro in 1965, Souza Leão suffered from schizophrenia and extreme paranoia that kept him chained to his house and psychiatric clinics for most of his life. Jorge Viveiros de Castro, the book’s first publisher, only met Souza Leão once in all the time they worked in the manuscript. It was surprising, to him, how lucidly Souza Leão spoke about being in the grip of mental illness. He was trapped inside his mind and inside his house, using only social media and email to communicate with the outside world. His reclusiveness awarded him a cult fan-base. Souza Leão told Castro that he had a feeling he’d only be famous after his death. In All Dogs Are Blue, Souza Leão writes: “Lots of things can be asylums.” The writer died in an asylum, at 43, just after the book was published. The rest of his works of fiction were published posthumously. None, however, as famous as All Dogs Are Blue, Souza Leão’s only work translated into English. The unnamed narrator is an inmate of a Rio psychiatric asylum. The book’s semi-autobiographical nature is revealed. Then the game of deciphering fictionalized reality from drug-induced fantasies and the makeshift reality in the narrator’s head begins: When he was six, aliens came and told him they’d be back for him, but thirty years later they have yet to arrive. While he waits, he fills his time obsessing over his mom’s tuna sandwiches, his sexual desire for female family members—except his sister because she is “stupid,” his blue dog, which is “the colour of Haldol,” and losing his virginity to a prickly boar. Meantime, he believes that the CIA and the KGB are tracking him with a computer chip he swallowed. Early in the novel, the reader becomes aware of the narrator’s duplicitous nature that manifests itself in shape shifting. For example, he goes through several physical transformations—turning into animals or celebrities at will. At times, the narrator becomes a dolphin, other times a whale. In one chapter, he fluctuates between becoming the surly Charles Laughton and the handsome Humphrey Bogart. “Attack on the left flank,” he says “It was my chance to turn into Humphrey Bogart.” In the cracks between worlds he can become whoever he wants. Beyond those flowers, surrounding the asylum, are favelas—slums—that are bourgeoning. Inside the asylum walls, ensconced in all that beauty, people’s minds decay. Some spend sunny days banging their heads against walls. Some are violent, even murderous. Others live each minute waiting for the their personal ends of the world. For some it’s death, for others it’s the end of the world, or it’s living the rest of their days inside the white asylum walls. And still others, like the narrator, who slip in and out of worlds to survey the wreckage around them and then crawl back inside their headspace. Daniella Bondar is a New York City native and an MFA candidate at The New School. She is working on a memoir about her fear of dirt. Find her writing at DaniellaRobin.com.